The primary objective of OSIRIS-REx is to return a sample of asteroid Bennu to Earth. Many of the functions required to achieve mission success – such as collecting solar energy for power or communicating with the Earth – are standard for any operating spacecraft. However, there are many unique challenges for this mission. One of our greatest challenges is accurately navigating the spacecraft in microgravity. Meeting this challenge is particularly important when we send OSIRIS-REx down to the surface of Bennu to collect the sample. How Does a Spacecraft Move Through Space? A spacecraft in microgravity has six degrees of freedom (6-DOF) of motion. Specifically, it is free to translate along three perpendicular axes – forward and backward, up and down, or left and right. 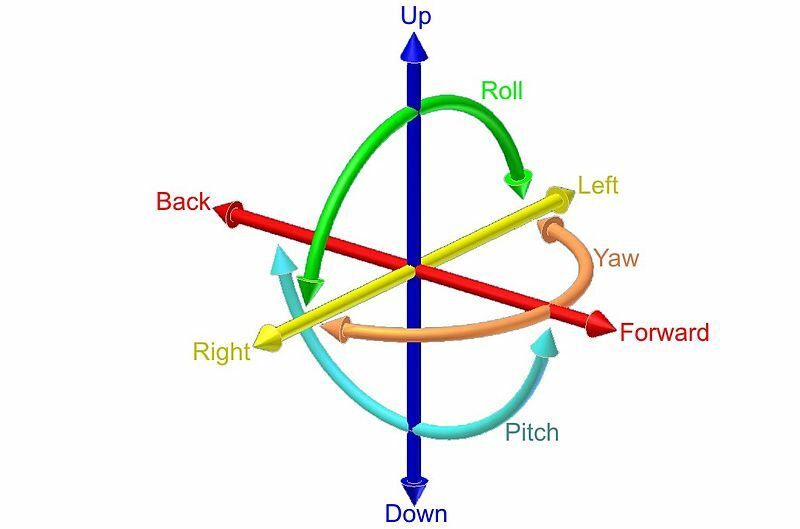 In addition, the spacecraft can rotate about these three axes, termed pitch, yaw, and roll. OSIRIS-REx is designed to control all of these parameters with exquisite precision. How Do We Control Our Pointing? OSIRIS-REx uses two different kinds of devices to control its direction of motion and its rotation. Reaction wheels are used when the spacecraft must be rotated by small amounts. For example, reaction wheels are used to keep the instruments pointed at a specific location on the asteroid surface during key observations. These devices are flywheels that use electric motors to change their rotation speed. As the wheels rotate the spacecraft counter-rotates as a result of the conservation of angular momentum. OSIRIS-REx can only use reaction wheels to rotate around its center of mass. We need rocket engines to apply a translational force to move the spacecraft from one place to another. What Kind of Rocket Engines Do We Have? OSIRIS-REx uses a wide variety of thrusters to change its velocity and direction of motion. These small rocket engines produce thrust when hydrazine fuel decomposes, expands through a sonic throat, and accelerates out the rocket engine nozzle. The main engines are 200-Newton (N) thrusters directed at the spacecraft center of gravity. A Newton is a unit of force that is equivalent to the gravitational force exerted on a mass of roughly one-quarter of a pound on the surface of Earth. These engines are used to perform the deep space maneuvers, the asteroid approach braking burn, and the asteroid departure burn. In addition, the spacecraft has a set of 22-N Trajectory Control Thrusters that provide attitude control (pitch and yaw) during the large maneuvers described above. These engines also provide thrust to perform smaller trajectory correction maneuvers, which are used to clean up the spacecraft state after the large burns. Most importantly, two of these thrusters are used to accelerate the spacecraft away from Bennu after sample acquisition. The ultimate in spacecraft attitude control is provided by a series of 4.5-N Attitude Control System thrusters. These thrusters are mounted on each corner of the spacecraft and provide full 6-DOF control. They are used for small thrusting maneuvers. In addition, since the reaction wheels continuously build up momentum, these thrusters are fired to remove this momentum in a process called “reaction wheel desaturation” or “taking a momentum dump”. One of the most critical maneuvers that OSIRIS-REx will perform is the orbit departure burn leading to sample acquisition. It is essential that we line up the spacecraft orbit and the asteroid rotation with extreme precision, so that we fly over the desired sample site at the right time. For this ultra-fine maneuver, the spacecraft will thrust using a tiny 0.07-N low-thrust rocket engine. Fortunately for us, these engines were just recently developed and qualified for the NASA GOES-R mission. This combination of reaction wheels and thrusters provides a wide range of control options for the OSIRIS-REx spacecraft. Such capability is necessary to perform everything from the large burns required to propel us through deep space to the meticulous series of alignments needed to safely deliver the spacecraft to the chosen sample site on Bennu’s surface. Dear Sirs,I read your new stuff named “Six Degrees of Freedom | dslauretta” like every week. Your story-telling style is witty, keep doing what you`re doing! And you can see our website about 高中化學. I know you are confident of the build from your AMA, but with the failure of what, half, the reaction wheels on craft , makes you feel. Pretty sure the AC thrusters can keep you spun down, but how much data are you planning to download with the high gain? sorry, been reading about the lessons learned on hayabusa. Since you are interested in cosmochem, what are your thoughts on the SDO imaging teams tweet that they didn’t see ISON in their cams, because they were tuned for oxygen, and they didn’t see ANY? With the cyanogen spectro they got on the inbound, and the fact they didn’t see any O, even from dust vaporization, what is your guess on the composition of these Oort cloud drive bys. Maybe a whole lot more kerogen out there than we thought? I have paid a lot of attention to the reaction wheel failures on Hayabusa, Dawn, and Kepler as well as those on FUSE and TIMED. The good news is that we are using a different manufacturer – those wheels have not experienced a failure in flight.